Join us during the last two weekends of August for the 2018 book sale! This year’s sale will be held on the east side of Athens in the space between the new Aldi and Mannaweenta, on the corner of Gaines School Road and Cedar Shoals Road. All books will be priced from 50 cents to $3, with prices dropping as the sale goes on! In 2017, the BFK Book Sale made $20,000 across two weekends and had over 800 guests. In addition to selling 17,300 books, we also gave away an additional 12,000 books to educators and fellow nonprofits for use in their own programs. And we couldn’t have done it without our generous 2017 sponsors. *Please note: some details may be subject to change. 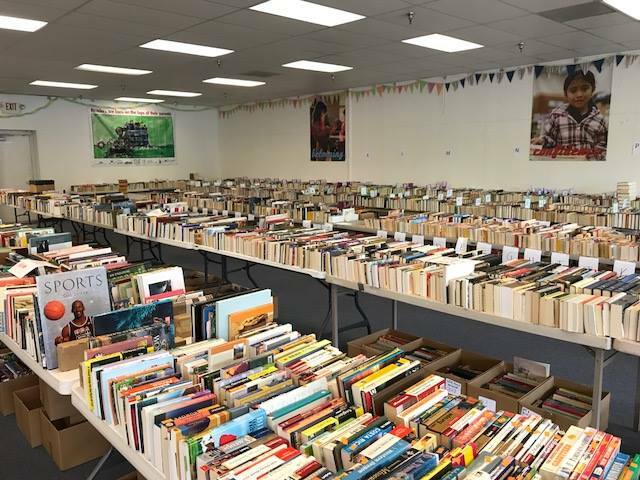 Want to stay up to date on all of the details for the 2018 book sale? Sign up for our newsletter! Thursday, Aug. 16, 5:30 to 7:30 p.m. – Preview Night, $10 entry fee for first pick of our amazing selection of books. $3 hardbacks, $2 paperbacks, $2 children’s books, and a terrific 50-cent section. Food and beverages provided! Friday, Aug. 17, 10 a.m. to 6:30 p.m. – Opening Day. $3 hardbacks, $2 paperbacks, $2 children’s books, and an impressive 50-cent section. Saturday, Aug. 18, 10 a.m. to 6 p.m. – $3 hardbacks, $2 paperbacks, $2 children’s books, and a huge 50-cent section. Sunday, Aug. 19, 12 to 4 p.m. – $3 hardbacks, $2 paperbacks, $2 children’s books, and a huge 50-cent section. Saturday, Aug. 25, 10 a.m. to 6 p.m. – All prices drop! $2 hardbacks, $1 paperbacks, $1 children’s books, and our discount books are reduced to 25 cents. Sunday, Aug. 26, 12 to 4 p.m. – Bag Day! Fill a plastic grocery bag with books for $5 or a canvas BFK tote for $20; Our Teacher Free-for-All is from 4pm to 5pm – bring a valid school ID or proof of educational nonprofit status and bags/boxes to cart away our excess books for FREE! No early birds please.